Free Flywheel Class on September 25, 2014 in Boston! 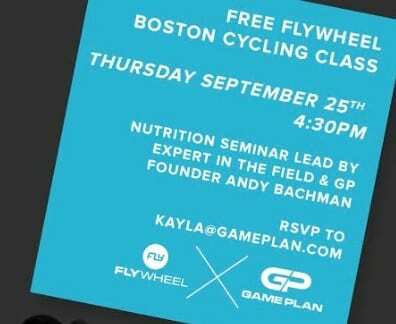 On Thursday, September 25, 2014 at 4:30pm, Game Plan, an all natural protein and nutrition company, is sponsoring a free Flywheel class on Boylston Street. This event is free but you do need to RSVP to Kayla@gameplan.com to request a spot because space is limited. If you are looking for more information about Flywheel, please head here.